Its a fairly well established fact that you cannot go to SxSW and see all the bands you want to see. For me, that band I missed this year was Sleigh Bells. I had only heard a couple of their songs, but there was something intensely engaging about this aggressive electronic music that made me want to catch them. 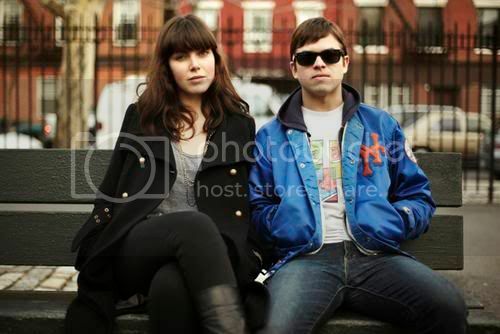 Sleigh Bells is a duo from Brooklyn made up of Alexis Krauss and Derek E Miller. They have a fascinating combination of hip beats, keys, metal and an occasional sweetness that can catch you unaware. Alexis appears to be as comfortable singing sweetly to "Have a Heart" on songs like "Rill Rill" as she is to belt out about "Dumb Whores" on songs like "Infinity Guitars". From the rave reviews that I've heard sense, it appears Sleigh Bells' performance lives up to the high expectations set by the overall bad-assery of their first album, "Treats". Luckily, I will have the chance to see for myself on Thursday, July 22nd at the Royale, here in Boston. [tickets] I am eagerly awaiting the opportunity. If you would like just one more preview, you can check out the recording from SxSW on NPR. Enjoy and we'll see you there.